How Much Aquarium Do I Need? Everyone scratches their head at one time or another and wonders how much they need of something. It's also true when getting started with aqariums. Maybe it's the size of a tank, how much gravel is needed to fill it, or how big a filter is needed. Or perhaps you wonder how big a tank is or how heavy it will be when it's filled with water. This list is intended to cover the basics of how much of various aquarium basics you need. Aquariums come in many shapes and sizes. 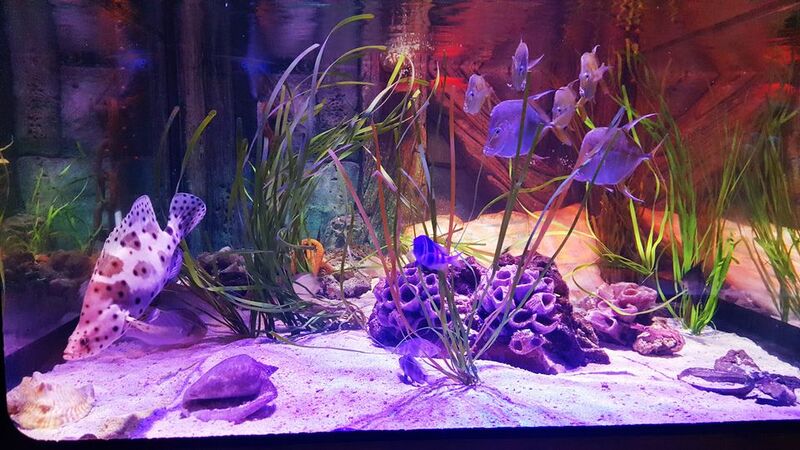 Although there are plenty of custom sizes, the majority of aquariums fall into certain standard sizes. Knowing the size, shape, and weight is very important when choosing a tank and stand, as well as a location to place them. What are the dimensions of standard tanks? How much do they weigh once you fill them with water? You can find all that information on the aquarium size chart. Don't forget that you need an aquarium lid too. It is wise to always keep an extra heater on hand. Your heater will invariably fail in the dead of winter on the weekend when all pet shops are closed. Your spare heater doesn't have to be the most expensive top of the line model, it just has to keep the water warm until you can replace it. Watch for sales and grab one or two inexpensive heaters as backups. In tanks that are 50 gallons or larger, consider two smaller heaters instead of one large one. The heat will be more evenly distributed, as you can place one at each end of the tank. If one fails, at least you'll have one heater to keep the water warm until you can get a replacement. Mini heaters have become quite viable in recent years. Consider using one if you are keeping fish that require tropical heat, such as the Betta, in a small bowl. It is also wise to have heater guard with glass heaters, particularly if you have large or active fish. Not sure what size filter you should get? The rule of thumb is that all the water in your tank should pass through the filter at least four times each hour. That makes it pretty easy to calculate what you need. When it's borderline, always move to a higher flow rate. For example, a thirty-gallon tank requires a flow rate of at least 120 gph (gallons per hour). If the filter choices are either 100 or 150 gallons per hour, you should purchase the 150-gallon one. The aquarium should be filled with substrate to a depth of approximately 2 inches. Now the question is, how much gravel will it take to do that? Is one bag enough? Are three bags way too much? For standard gravel/rock based substrates, a general yardstick is to use one pound of substrate for each gallon of water. Keep in mind that if you have an unusually shaped aquarium, it may require more or less substrate than that. This is particularly true when selecting substrate for planted tanks, as plants have specific requirements when it comes to substrate depth. Big can, little can, or multiples? Food is an area where everyone tends to overestimate all around. Fish owners usually buy too much food and tend to ​overfeed their fish. Unfortunately, fish food doesn't retain its nutritional value for long once the package is opened. After a month, the container should be discarded. So until you are accustomed to what your fish eat, the best practice is to purchase a small container of food and feed sparingly. Do I Need a Special Stand for My Aquarium?